ramv wrote: I have 20 lb power tank. Works awesome if you need to pop a bead on, run an impact wrench or air up quick. Great tool. CO2 is amazing in this application. Big, heavy, can run out are the downsides. Thanks for the info, I am leaning this way ... have to get something soon. You get the "kit" or just the twin compressor & hard mounted it ? 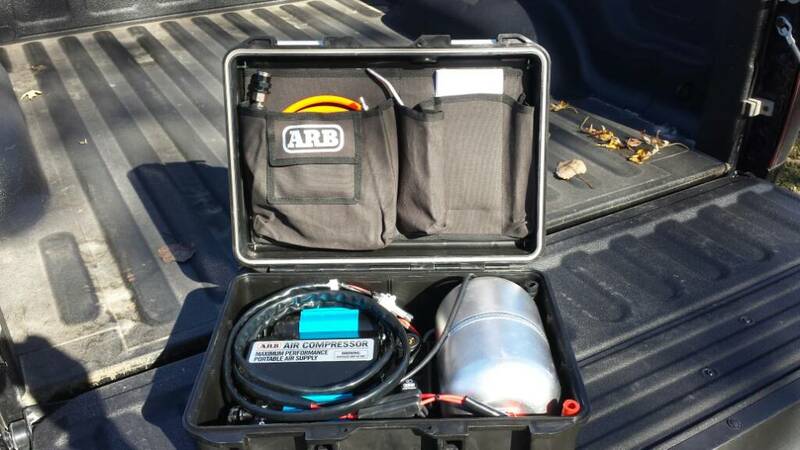 I got the Powertank regulator and accessories and then got an aluminum CO2 tank at my local Airgas on lease. Cheaper and easy to swap out. Not as pretty as the Powertank powder coated one, but easier to deal with if you have a local air gas. I have actually considered going to 5 lb cylinders and just get a couple from my local liquor store. Easier yet! 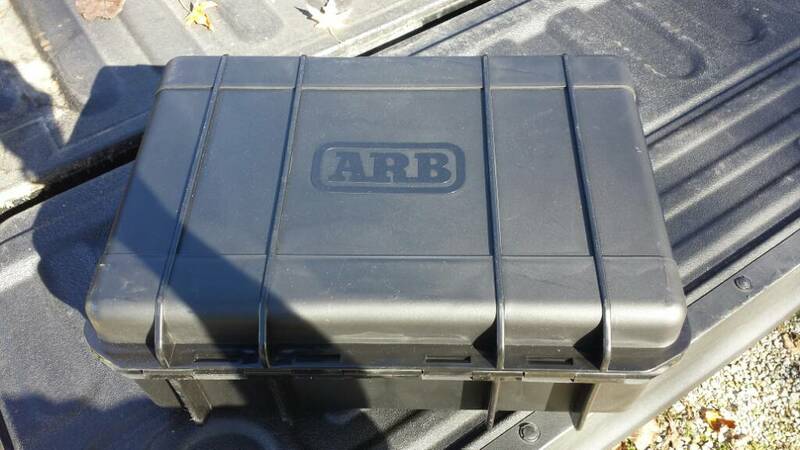 I got the twin ARB in the hard case a couple months ago, but haven't really had the time or gotten the chance to use it yet. It is a very nice piece though, very well made and put together. Only thing it needs is a tire pressure gauge thrown in with it. TwinStick wrote: You get the "kit" or just the twin compressor & hard mounted it ? Thanks man, I may do the same thing, makes sense!! Lol, I would almost let you if I didn't have such random things pop up every now and then. I'll buy something after I need it, then never need it again for 3-6 months it seems like. 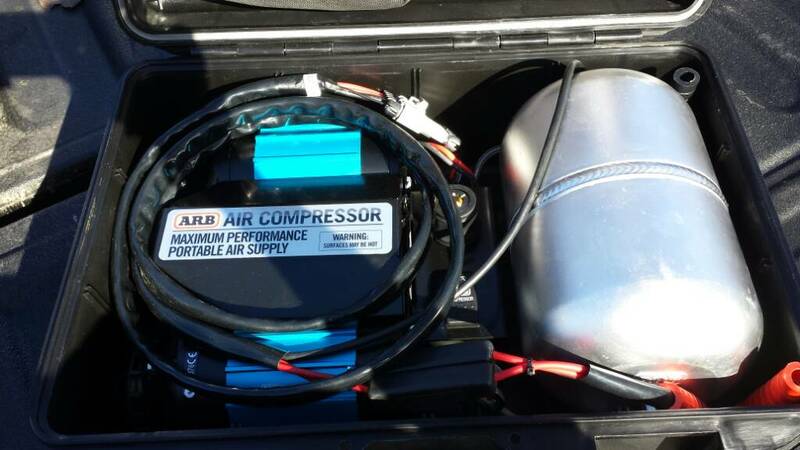 I've been looking at air systems for my 3g non-PW ram 2500 Hemi truck as well. I have all the parts, and most of the fabrication done to put a big displacement York piggy-backed off the alternator like Jeepspeed does it. However, every time I hold it up for positioning of the compressor, I just can't find a place between the airbox and the alternator that I'm happy with. I had a K&N Cold air intake on it at one point, to give me more mounting room, but the intake noise was defeaning so I took it back off there. I had actually given up and was looking at a PUMA PD1006 compressor from Buzzard offroad. The specs on it look good, and there are lots of favorable reviews in the offroad forums about it. On another note, I modified a Chrysler RV-2 for my 48' with the LA318, that will flat out stomp a big displacement York ( I can run two 3/8" lines off it airing up two tires at once, and maintain 90psi system pressure, just off idle). If I could figure out a way of putting one of those on there, I would. They're bigger an bulkier than a York though. I'm trying to figure out a mounting solution for my York as well. I've even looked underneath the engine... There's not really anywhere good. But you should be able to throw the Jeepsoeed kit in and call it done. It should bolt right in. I don't think you get an option of where it goes. I can't find the pictures of it now, but I believe it was mounted on a Hemi engine that had been transplanted into a Jeep of some kind, with a non-stock air box setup. Think it was a link on Dodgetalk. Either way I remember for sure the compressor was to the left of the alternator laying on its side. In my truck with the compressor in that position I don't have much room for the fittings coming out of the compressor head, not to mention any kind of belt adjustment leeway. I haven't looked at it in awhile, but I vaguely remember thinking if I set the compressor slightly higher over the alternator, and left myself enough room for the fittings and belt adjustment It would barely have enough room to clear the hood when it closes. I remember thinking that the mount was uncomfortably close to the "hot" stud on top of the alternator too. Here's the pictures I saved from Jeep Speed Shop about a year ago. I just couldn't justify the expense for a York system, for something I would only use a couple times a year. I still need to do a tank and plumbing, but I'm in no hurry. Ya, with the stock airbox I wasn't real happy with the amount of room I had around the compressor, and I wasn't real happy with the CAI when it was on the truck. The main reason I was going the York route to begin with, was because I already had all the parts, fittings, etc. It kind of got put on the back burner for a bit though. It would be handy to be able to run a half inch impact, as well as airing up the tires, etc. I used to maintain a fleet of tow trucks and they all had York OBA with 9 gal. tanks and they got used everyday and were awesome. The problem with a York system is that it's not truly portable. 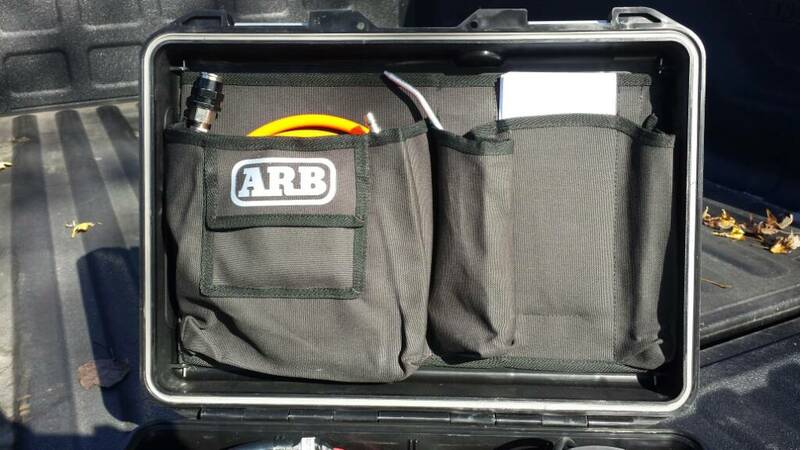 If I remove 3 bolts and disconnect a wire connecter, my Smittybilt is portable again and self contained in a canvas bag. When I buy my new 7th gen. retro flat fender PW, I'll already have an air compressor for it. I think It also has the same or better CFM numbers than a Viair, if I remember correctly. Numbers on the 2781 model are pretty good. 5.65CFM @ 0psi, 40min, duty @75deg. Portability would be nice too. Now ya got me looking again. Anybody running the Masterflow MF-1089?? BLM you don't need your compressor, Mopar already announced that the retro flat fender Wagons are getting onboard air. They even come with tire chains now too. Plain white 2008, 35" Duratracts, Bilstein 5160s. Ya, I got a Puma in my watch list on ebay $234 free shipping. Lots of good reviews on the web. Haven't given up on the York setup yet, but its been in the same half finished state for close to a year now. DamageWagon wrote: BLM you don't need your compressor, Mopar already announced that the retro flat fender Wagons are getting onboard air. They even come with tire chains now too. Dylan Robinson wrote: Numbers on the 2781 model are pretty good. 5.65CFM @ 0psi, 40min, duty @75deg. Portability would be nice too. Now ya got me looking again. That's the one I have. I think I paid $140. Very happy so far. Dylan Robinson wrote: Anybody running the Masterflow MF-1089?? That's the one that Coder said he has on page #1 of this thread. He said it's served him well. Smittybilt 2781 mounted in front of the radiator, hardwired with 50 amp quick disconnect coupler. It's mounted on an angle to match the angle of the grill and trans oil cooler. So do you have a jumper cable connection wired up to a 50 amp quick disconnect so you can use it as portable setup, or is more or less permanent mounted? It's a 2.18cfm, but 50% duty cycle compared to 40% like most others. The Smittybuilt has the highest volume rating at 5.65cfm.